Dell Inc. designs, develops, manufactures, markets, sells and supports a wide range of computer systems and services customized to meet customer requirements. Dell’s products include servers, storage components, workstations, networking products, notebooks, desktop computers, printers, imaging systems, software, peripherals, and support services. The Dell Defense Services group develops enterprise hardware solutions for government applications. These products are uniquely integrated and designed for semi-mobile use in conditions that exceed normal operating ranges. The US Air Force contracted Dell to produce an integrated deployable network system named Theater Battle Management Core Systems (TBMCS). The system components would be mounted in hardened cases, stabilized with custom hardware, and interconnected through signal entry panels (SEPs) that provide convenient access to internal cable ports. Rather than parse this work out to multiple design, machining, and manufacturing firms, Dell hired Deaton Engineering (DEI) to design and manufacture the custom hardware, integrate the complete product solution and ship it direct to the customer. 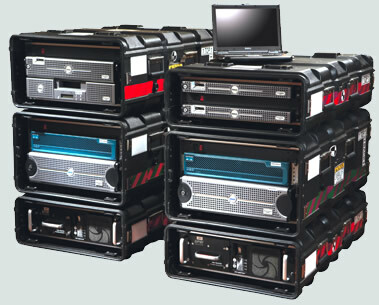 Innovative designs were created to stabilize the contents of each case. Deaton Engineering developed a unique wedge bracket, support plate and redundant tie-down strap to secure internal components. The final design enabled all support hardware to be installed or removed using a single, standard tool provided with each product. A strain relief bracket was also developed to secure power cords on components lacking a strain relief mount. DEI engineers created custom-labeled SEPs mounted at the rear of the case to provide a single interface for connectivity. The panels provided the user with convenient access in addition to significantly reducing time required for setup and configuration in the field. Finally, the DEI manufacturing group integrated the entire suite by assembling each unit and performing a quality assurance inspection prior to shipment.